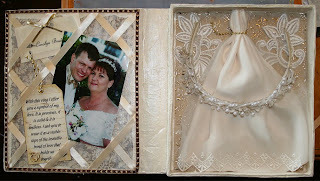 OK, finally I have got a chance to sit down & post the pics & directions on how I made my wedding memorabillia box. 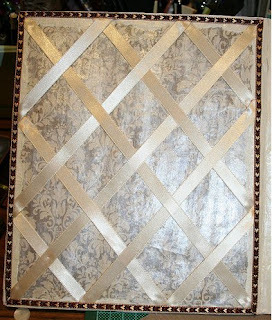 For anyone who hasnt seen it, this is it finished - the front & the inside view. 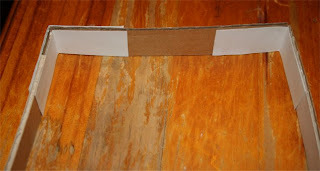 I started out with a piece of cardboard - Im not even quite sure where I got it from now, but it was packing inside a box that something came in at christmas time I'm sure. 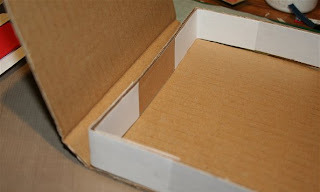 I then cut off pieces from the end & stuck them together with some cardstock to make a cardboard "frame" that would eventually become the recessed section of the box which I then stuck to the cardboard. 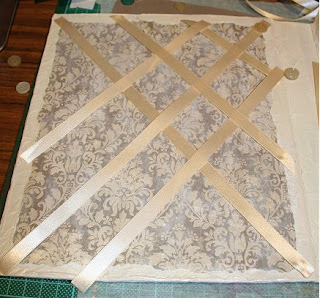 Next I started covering it all with torn tissue paper & watered down PVA glue, I love the effect that the torn tissue paper gives, I use it alot . 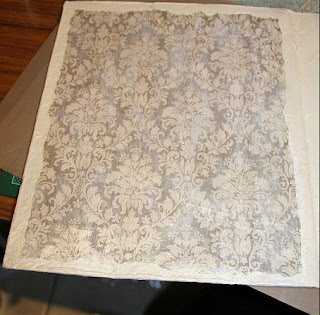 I make sure that I glue lots of pieces of tissue paper over the edges & joins which gives it plenty of strength. Lots & lots of layers later, I let it dry overnight (some take longer, this cardboard dried fairly quickly) & the next day painted it with some acrylic paint & then with Twinkling H2Os & left it to dry completely. 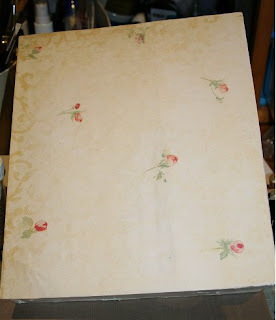 Then I started with the paper, I glued a torn piece to the inside of the front cover & distressed it with paint. After it was dry I started to build a network of ribbons to make it into a noticeboard type area weaving them in between each other. 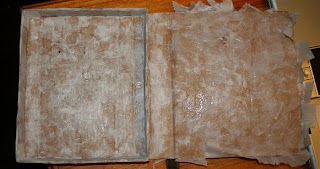 Lastly I finished it off with some ribbon around the edge. 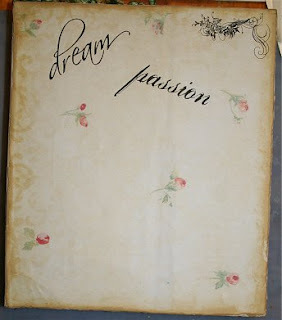 Next I took a piece of paper & glued it to the front of the box & distressed & then inked the edges with distress ink. 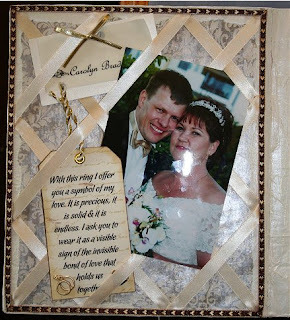 I then added some rubons & mounted a wedding dress embellishment I had made with foam tape. 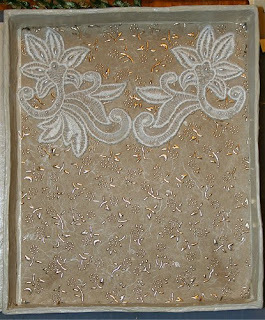 Next I put some lace & diamontes across the corner & added a flower I distressed with ink & a heart made with a mould & Delight & painted with my gold Krylon pen on the corner. 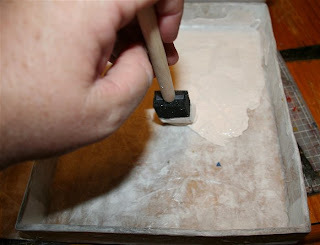 Lastly I coloured a key made from a mould & Delight again with the gold Krylon & that completed the front. 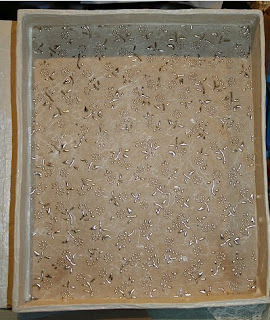 The inside of the box I covered with a textured stuff like mulberry paper with gold flecks in it. 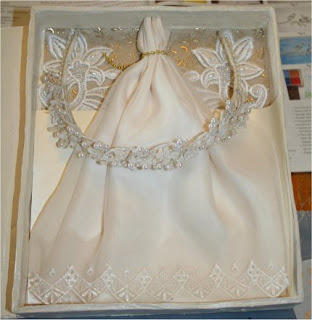 Then I glued a couple of pieces of the lace i had on my wedding dress to the inside, ppopped an Order of Service inside & put material from my dress & the hair garland I wore that day in on top. 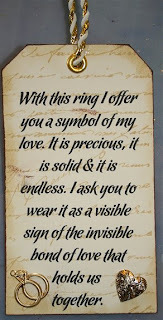 Lastly I made a tag & printed on it the words that we said when we exchanged rings (my DH wrote those words, in fact he wrote 90% of our marriage ceremony :) ), stamped it with my script stamp (thank you Sharon!) 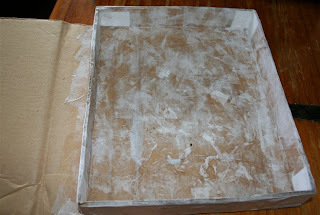 & distressed the edges & tucked it along with a left over place card & a pic of us into the noticeboard. So there you have it, if you have lasted this long you deserve a medal & a pat on the back, hope you enjoyed watching how it was all created. Awww, Robyn! it's beautiful! I've been looking for wedding things to make for our wedding in September. Thanks for the inspiration! 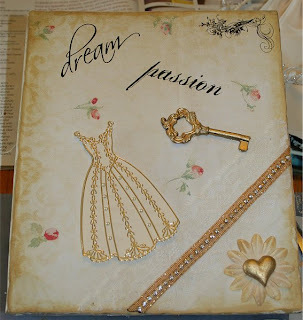 Your wedding box is gorgeous! Oh Robyn....this is so darn beautiful!!!! Sweetie, you really have been busy....no wonder I've not heard from you lately. I was just reading about the wildfires over there, plus the flooding in the Queensland area. Are you and yours safe??? omg that is stunning. i hope you are sending it in to be published somewhere. it is just beautiful. Beautiful keepsake Robyn! Love that you used a few Krafty Lady Art Moulds. If you'd like it to be added to the Krafty Lady gallery, contact France (webmaster) and she'll arrange it. Scroll all the way to the bottom of the Galleries page and you'll find her name. Click on that and you can email her direct. OMG! This is just fantastic. Wonderful keepsake indeed. Catch you in the forum @ Allcraftz.